Interventional cardiology refers to catheter-based treatment of cardiovascular diseases. This dynamic new field is one of the fastest growing fields in medicine. In the United States, more than a million percutaneous coronary interventions (PCI) are performed annually; moreover, the number of procedures performed will likely continue to increase. The field of interventional cardiology has evolved dramatically over the past decade with the availability of embolic protection devices, drug eluting stents, mechanical thrombectomy catheters, etc. Interventional cardiology represents a rapidly moving target for the cardiologist who seeks to integrate recent advances into their clinical practice. The advent of newer technology presents both an opportunity as well as numerous challenges for the cardiologist to treat patients optimally. 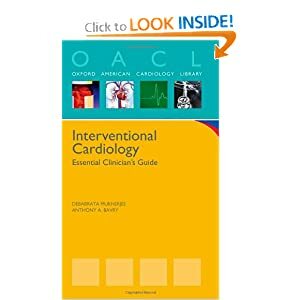 Interventional Cardiology: Essential Clinicians Guide (Oxford American Cardiology Library) aims to provide clinicians with concise, easily accessible guidance on the pre-procedural, procedural and post procedural aspects of PCI in general situations and in various specific clinical settings. The volume features evidence-based discussion on patient selection, vascular access, general principles of PCI, and various specific settings and optimal post procedure management of these patients. This handbook focuses on tailoring stent type to the individual patient, taking into account specific risk factors and comorbidities, appropriate use of embolic protection and thrombectomy catheters. Highly practical in format, content and style, Interventional Cardiology: Essential Clinician's Guide serves as a succinct, yet comprehensive, easily accessible point-of-care reference for busy practitioners. Useful tools, such as treatment algorithms, charts, tables and illustrations assist in making this volume a practical reference tool.